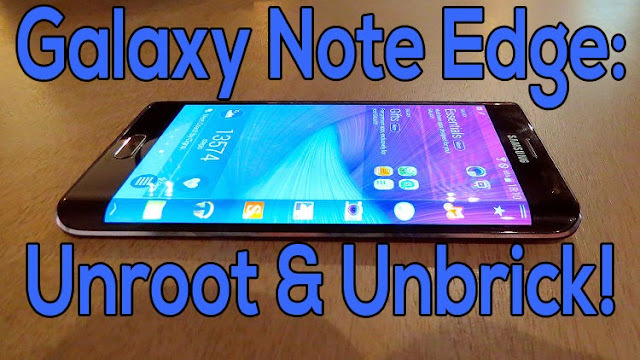 How to Unroot/Unbrick Galaxy Note Edge! ~ AndroidRootz.com | Source for Android Rooting, ROMS, Tricks and More! How to Unroot/Unbrick Galaxy Note Edge! Follow this step-by-step guide to completely unroot/unbrick the Galaxy Note Edge and bring it back to complete factory settings. This guide is straightforward and just follow the steps and your phone will be back to original settings just like the day you first bought it. Unbrick your phone if it's in a bootloop. This will remove all information from your international storage, backup any important information! Follow the guide below to unroot/unbrick the Galaxy Note Edge! 1. Enter into Download Mode. Power off your phone then press and hold the volume up, home button, and power button all the same time. 2. You will now see "Warning" on the screen. Press the volume up to continue. 3. Now the phone will show "Downloading..."
4. Plug in your phone via microUSB to your phone. Plug in the USB side directly into a USB 2.0 port. 5. Download Odin3_v3.10.6.zip and the correct stock firmware for your Galaxy Note Edge using the download links below.